"Wilderness" is a word Utahns hear in the context of dispute. It is a word that many of the state's leaders revile, while outdoorsmen and -women, conservationists and environmentalists, love. There are many places, though—in Utah and outside of Utah—where blocks of wilderness have been set aside for the solitude and the sanity of all humans. One such place, and the focus of this story, is a massive blank spot on the map in central Idaho known as the Frank Church River of No Return Wilderness. Here, hundreds of miles of wild rivers, undammed and untamed by man, flow through vast gorges—one deeper than the Grand Canyon—and split rugged, pine-carpeted mountain ranges. Here—if only for a short while—a man, woman or child can feel closer to that uncategorized feeling—nature, freedom, solitude—that, acre by acre and inch by inch, is so easily destroyed by the blade of a bulldozer, the bit on a drilling rig, the imagination of a city builder and the dammed waters—the goddamned waters—of rivers constipated by concrete wedges. 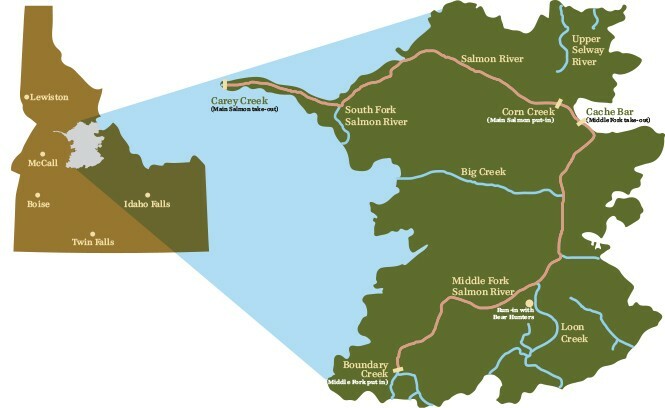 This wilderness contains two rivers of particular interest, the Middle Fork of the Salmon and the Main Salmon, which the author floated in May and in July 2015, respectively, linking up a 184-mile stretch of water that, apart from the occasional airstrip and fishing cabin, are about as far from civilization as is possible in the Lower 48. Why does a spot of rugged Idaho wilderness matter to Utahns? As it turns out, Utahns make up a hefty portion each year of the river-runners who attempt to navigate these waters. And as Utah lawmakers continue their multimillion-dollar fight to wrest around 30 million acres of public lands from the federal government, the River of No Return wilderness serves as a shining example of how the longsighted wisdom to set something aside, to save something for everyone, has a value that dollars cannot buy. The wild places of America grow scarcer each day, and as the Beehive State grapples with the impact of a population that planners and politicians insist will double in the next 35 years, wilderness—or what remains of it, anyway—will forever be under assault by the march of human progress. This is true in Idaho, in Utah, and anywhere else where pine trees sway, rivers run free and oil, coal and other natural-resource deposits sit locked beneath the dirt. Cort Conley, an Idaho historian, author and boatman who has written guide books about the Main and Middle Fork, says that over the past century, nine dams have been proposed on the Main (the longest undammed river in the nation) and roads have been drawn up to run alongside the rivers. Through a combination of luck, good timing and far-sightedness, none of these plans has been realized. "They represent a legacy of a pretty intact ecosystem," Conley says of the rivers. "I really believe that it's such a special place and will only become more so with time." Conley, though, has witnessed his fair share of losing conservation battles along the rivers, and he reckons that, just like wild places in Utah, Idaho will remain under assault by miners and developers long into the future. "There's always going to be people who would sell Yellowstone for steam power if they saw a buck in it," he says. "There's always going to be private or corporate avarice seeking to sell resources for private or corporate gain." So, in honor of the wild places that do exist, draw some lines on a map and walk, row or crawl out to some distant, vacant space you've never been before. Take a little water, pack a lot of beer, and have some fun. "I'll hunt you," the man said, no sarcasm detectable in his tone, not a wrinkle of BS on his face. "Give you a 30-minute head start, no binos, and you can wear camo." "Binos" are binoculars. It was supposed to be a relaxing night of drinking beer and chilling out in the steaming water of the Loon Creek hot spring, an outpost accessible only by trail, raft or airplane in the heart of the Frank Church River of No Return Wilderness, when we stumbled upon the hunters. We were outnumbered and badly outmuscled. Most of the hunters were barrel-chested men with forests of black chest hair. Holding numerous bear- and wolf-killing permits, they were armed with high-powered rifles. An unknown number of them were Mormons. All were Idahoans; two were women; one clutched a Busch Light. We were eight river-rats from the city. Two women, six men. Four on a pair of rafts and four kayakers. We had no guns but were rich in beer, since several in our party had failed to consume their eight- to 12-beer-per-day allotment. The hunters were happy. They explained how, earlier that day, from 300 yards away and on the opposite side of the river, they had killed a 6-foot-tall male black bear. Discarding the bulk of the animal, the hunters took the fur and the skull ("looks a lot like a human," one of the men said) as souvenirs. And the hunters were not finished. They held three additional permits for bear and four for wolves. One described the time he had heard a wolf howl. "It was blood-curtlin'," he said. Q: Will you use the fur for a coat? Q: How many times did you shoot the bear? A: Three times: At least once in the head, because a bullet was found lodged in the bear's skull. Q: Does bear meat taste good? Q: How many permits for bear are issued in Idaho? Q: Where did you get your permit? A: At a gas station in Salmon. Q: How much did you pay for it? Then I confided to the hunters a morbid thought: "I wouldn't mind being killed by a bear, lion or wolf. Better way to go than a car crash." At this comment, the conversation went quiet, and the man sitting closest to me said he didn't have much say over what a bear does. But he'd be happy to hunt me. After three full days into a spring trip down the Middle Fork of the Salmon River, a man offering to kill me in the forest didn't seem like a huge deal. 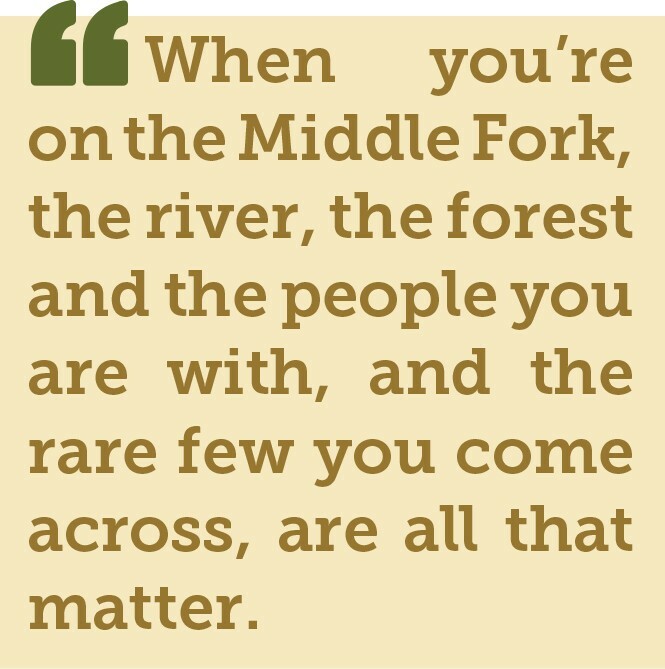 When you're on the Middle Fork, the river, the forest and the people you are with, and the rare few you come across, are all that matter. There is no connection to wherever home is, no lines to communication to bosses and loved ones. You are free to float in peace, and attempt, if only for a few days, to concentrate on little more than the moment. And, under the oddest of circumstances, you might even get to imagine yourself decked out in camouflage, sprinting up a mountain, a bino-less bear hunter hot on your heels. Utah has its fair share of rivers—big, silty, beautiful ones like the Colorado and Green rivers. But, compared to Idaho, the Beehive State lags in a very enticing category: wild and scenic waterways. Of Utah's 81,899 river miles, only 169.3 miles of the Virgin River and its tributaries are protected under the federal Wild and Scenic Rivers Act, according to government statistics. Idaho, on the other hand, has 107,651 river miles, 891 of which are protected under the act. 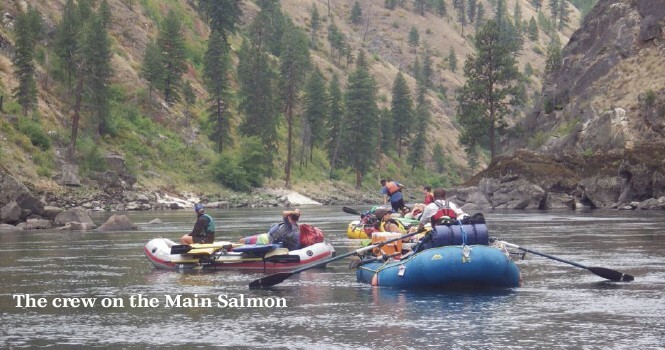 And a significant portion of Idaho's wild rivers can be ticked off and seen first-hand by river runners ambitious enough to link up the Middle Fork's 104 miles with the main branch of the Salmon River's permitted 80 miles. These nearly 24,000 souls competed to win a total of 1,095 permits on these four rivers. On the Middle Fork, 387 permits were issued, while the Main saw 310 permits awarded. Utahns account for a good share of those wishing to run these rivers. On the Middle Fork, 892 Utahns applied and 33 won, accounting for the fifth-largest share of applications in the country. On the Main Salmon, 704 Utahns applied, with 23 walking away with permits. While it's not impossible to draw a permit through the lottery, I have known only two people lucky enough to win a permit for the Middle Fork. And for ambitious river runners, waiting until next year isn't really an option. This is where my pal, the River Permit King, comes in handy. 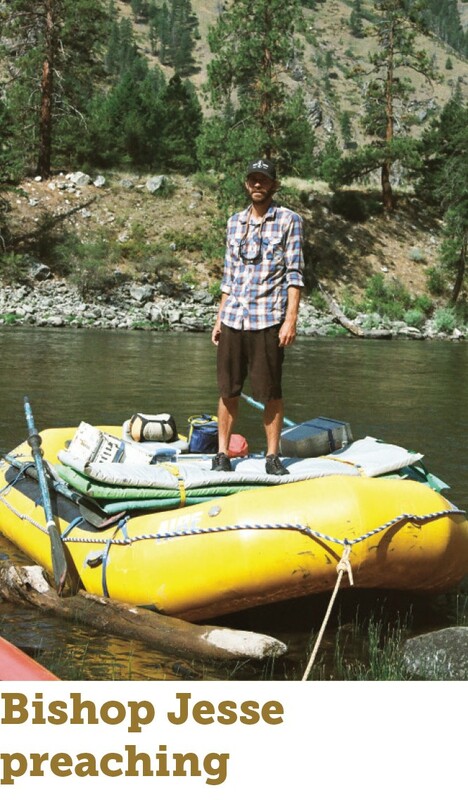 Though he has never personally won a permit on any of the Idaho rivers, a mix of determination, flexibility and an insatiable lust for rowing his yellow 15 1/2-foot raft has delivered him down the Middle Fork for the past seven consecutive years. Of course, the River Permit King, whose real name is Steve, needs companionship on the river. That's where I and several other river runners come in. If the river is our church, then RPK is our prophet, and we follow him around wherever it is he wants us to go. It's tough to say exactly who crowned the River Permit King. What matters more is that it is among the truest nicknames ever bestowed upon a person. The RPK's luck is no better than the rest of us, and he never draws a permit through the lottery system. To be clear, RPK, along with the rest of the river-running community, religiously pays modest fees (Four Rivers entries cost $6) to enter the lotteries every January. Many groups of river runners in Utah throw large parties for their friends and families, at which everyone assists and colludes on dates, times and rivers that must be run. 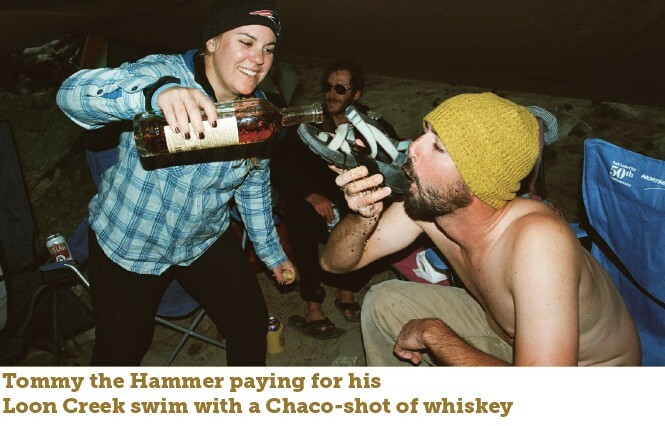 If one person wins at a river-permit party, that person is expected to invite a hefty portion of the others who attended that party on the trip. Mutual invites are expected all around. But when a group comes up dry—the norm for our group—what then? This is where the RPK shines. Some people who draw lottery permits aren't able to show up on the date and time of their launch. Rather than failing to show—which earns you a three-year ban from the lottery process—permit holders can cancel their permits a month ahead of time, freeing up the permit for someone else. The primary problem with picking up cancellation permits is time. Even with months of preparation, spending a week in the wilderness far from grocery stores, hospitals and cell phones is a difficult task. And planning for one of these trips in a couple weeks or with only a month's notice is even harder. Another obstacle is that these rivers, especially at high flows in the early spring, are swollen freight trains that roar into vicious rapids that take some level of experience to navigate safely. This narrows the field greatly. But if one fails to draw a permit through the lottery, a cancellation can be obtained. And the RPK picks up rare river permits the way the late basketball star Wilt Chamberlain picked up groupies: prolifically. So far in 2015—a year that left the RPK permit-less with the exception of the Smith River in Montana, which ran out of water before he could run it—the RPK has picked up cancellation permits on the Yampa River in Colorado, which is the last major free-flowing river in the Colorado River system; two permits on the Middle Fork (one was for May 24, and RPK managed to switch it out for a launch on May 28, because that date worked better for the crew); and the Main Salmon River. 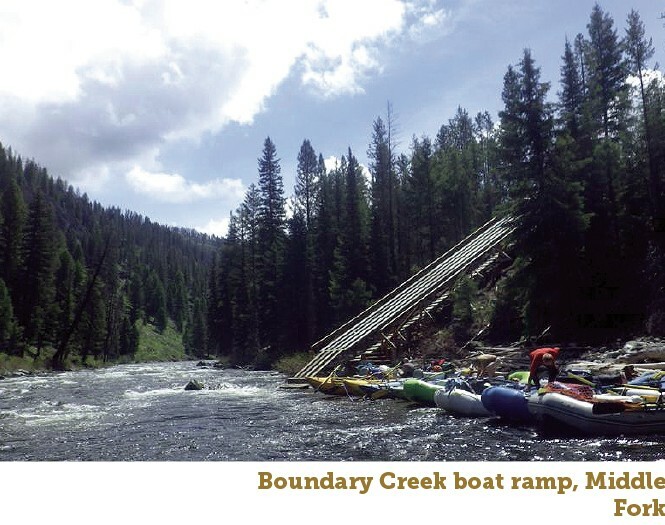 This last trip, down the Main, was a last-minute pick-up that the RPK obtained when he realized the water level in Montana would not float his boat. And this final permit is, perhaps, the most impressive. July is prime-time lottery season for the Main Salmon. According to U.S. Forest Service statistics, 534 people applied for a permit for July 8. Four people were awarded a permit. One cancelled two weeks before the launch, and the RPK put his hooks into it. While this permit filled RPK's immediate needs, it also afforded several of us who floated the Middle Fork in May the opportunity to continue down an 80-mile stretch of the river, seeing both the Middle Fork and the Main in the same season. Although it's unusual to pick up a cancellation permit during prime season, it's much easier to do so on the "shoulder" seasons. In late May and early June, the Middle Fork typically gushes at a wild rate, making it unappealing and, at times, downright unsafe to run. 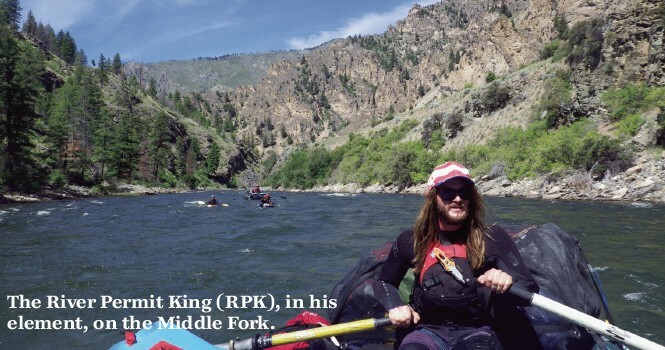 But this is exactly when RPK likes to run the Middle Fork, and snagging early-season permits on this pristine artery that hosts around 300 rapids hasn't proven particularly difficult for RPK. It is the tenacity of RPK that allowed us this summer to link up—not consecutively—the Middle Fork and the Main Salmon rivers. Once plans for a river trip are set in stone, all kinds of tasks await. You have to get your gear together: at least one stove, tables, chairs, tents, warm clothes, cool clothes, rafts, oars, kayaks, ropes, first-aid kits, cooking supplies—basically everything you'd take car camping. Two significant necessities must be calculated, tabulated and accounted for: food and drink. Our crew prefers to take care of the first by divvying out meals among various members. For example, I took on a single day's meal: breakfast, lunch, dinner and cocktail. Cooking on the river is a good time, but the RPK and his followers tend to rise around 9 a.m., eat at 10 a.m. and, somehow, consistently fail to make it onto the water by noon. This makes for long days on the water. And if you get to camp as the sun is setting, cooking a meal from scratch in darkness is a hassle. The night before a river trip, I spend the evening cooking. Biscuits and gravy for breakfast, a hummus-and-vegetable wrap for lunch and tamales (from Victor's Tires) for dinner. Once all of the gear is packed on the trailer and miles start to fly, the debate on beer begins. If Idaho is the destination, then buying a bunch of beer in Idaho is a good way to go. 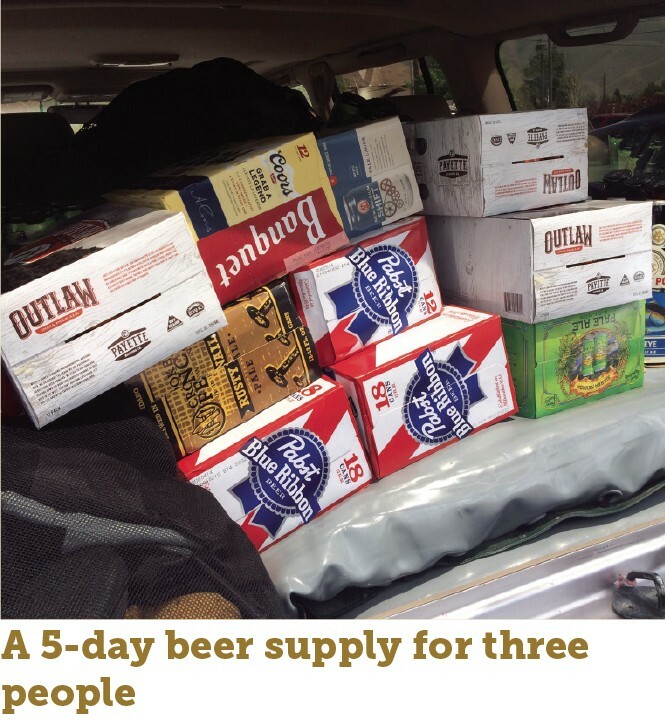 But how much beer does one person need for a river trip? This question is debated furiously in the river-running world. For a newcomer, it is easy to underestimate the volume of barley water needed to get down a river. A key factor is the mode with which one is floating. For kayakers, it is a proven fact there there is less time to drink beer—and less carrying capacity—than those who ride on rafts. 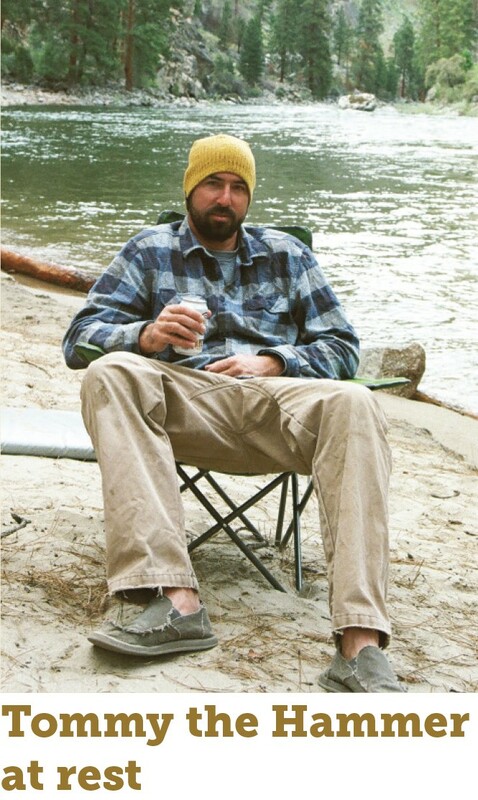 A safe beer budget for a kayaker, then, is eight to 10 beers per day. A beer-loving rafter, on the other hand, should probably budget at least 12 beers per day. Sometimes you drink more, sometimes less. And whether or not you drink all of these beers is not the point. The most important thing to consider when you're in some neon-lighted grocery store for the last time for a week is to buy enough beer. "Enough" beer is the amount it takes to feel calm and confident that you won't run out as the river days drift by—a fearful reality that haunts the dreams of anyone who has ever rationed too modestly and looked on as their friends gluttonously imbibed. Most multiple-day river trips—in Idaho and Utah—require special equipment to ensure that campers follow the "leave no trace" wilderness etiquette. Leave no trace means exactly that. And river runners usually abide. It is the norm along the Middle Fork and Main Salmon rivers to arrive at a pristine campsite and, aside from the occasional footprint in the sand, fail to find any sign of human life. A few key precautions must be taken to ensure that no signs of the nightly party around the campfire are left for future visitors. For a fire pit, a fire pan, elevated off of the soil with a fire-resistant fire blanket placed beneath, is used. All trash, including ashes from the fire, is gathered and hauled out. Dishwater is strained above the high-water mark so that solids can be thrown in the trash, which is collected and carried on a raft for the duration of the trip. Rangers politely ask that river runners pee in the river, so as to prevent campsites from reeking like a kitty-litter box. And then there is poop. We humans poop, preferably, every day—or even twice or three times a day. And, for whatever reason, many humans believe that they have the right to put poop wherever they wish. The common myth holds that digging a hole a few inches deep, filling the hole with feces, burning the toilet paper and covering up the hole suffices as good wilderness behavior. Lake Powell is a good example why this is not true and how human waste can ruin a person's day. In the mid-1990s, when boaters were busy pooping in the sand all across the big bathtub, many beaches had to be closed due to E. coli—a bacteria indicative of the presence of human waste. Each year, roughly 10,000 people float down the Middle Fork and Main Salmon rivers, and if every one of them took a dump in the weeds—well, it would cause some problems. On the river, the matter of poop is taken care of by a "groover." Nothing special, the groover is a toilet seat set atop a military-surplus ammunition can with a special liner. So named for the days before rafters discovered they could place a toilet seat atop the ammo can and instead sat on the edges of the box, leaving grooves on their hindquarters—the groover is an effective, and enjoyable, way to crap in the woods. No view is finer than the view from a groover. Placed at the right perch down among some boulders, the river coursing past just feet away, or up in the trees along a creek, it makes for the finest bathroom experience around. Of course, a groove session can be soured by mosquitoes or some other beasts, but typically, after several days of grooving with a view, returning to a conventional toilet at home is a disappointment. Because the rafters lug the kayakers' beer and gear down the river, kayakers often find themselves in charge of the groover. Kayakers carry the poop box and assorted toilet paper and toilet-seat box to and from the boats. Kayakers also get to set the groover up wherever we want, and so must become experts of views and surveyors of flat ground. When a groover begins to fill, it is the responsibility of the kayaker to initiate a poop-compacting method that involved picking the groove box up and dropping it on the ground. The groover box or boxes remain in their various states of use throughout the trip and can be emptied at an RV park, or anywhere else where people go "camping" with satellite television, generators and 1,000-square feet of air-conditioned space on wheels. 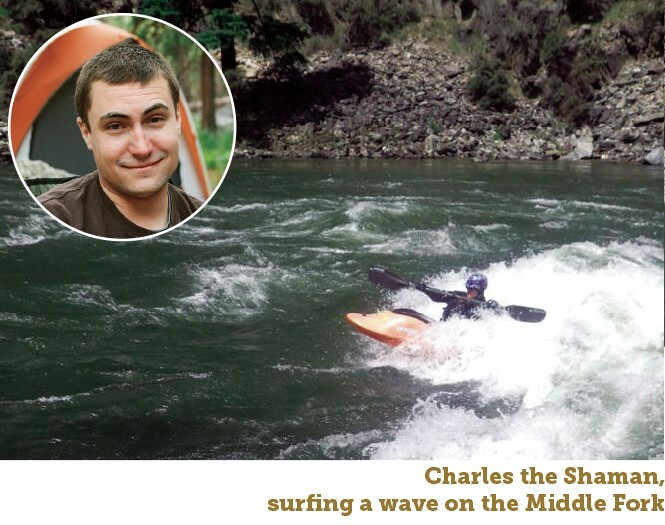 Our pal Charles the Shaman, who describes himself as "kayaking swine," is a groover enthusiast. He loves to set up the groover in plain sight of the river and he enjoys being spotted there in the late morning as more punctual parties pass by on the water. Charles sees it like this, and explained it thusly to my 8-year-old daughter on the Main Salmon trip: "Setting up the groover is a way to get the most respect for the least amount of work." Words to live by. So goes the wisdom of Charles the Shaman, who no one begrudges for failing to help carry stoves, tables and coolers to and from the kitchen area, because he can be counted on for taking care of the poop. At the put-in at Boundary Creek, not far from Stanley, Idaho, the Middle Fork originates in an alpine forest thick with ponderosa pine trees. From the boat ramp—a wooden structure (that could be a ski jump) drops from the ranger station straight down to the river—the river is swift, shedding 40 feet of elevation per mile. The Middle Fork also immediately begins to grow, picking up side streams that make it swell in size. 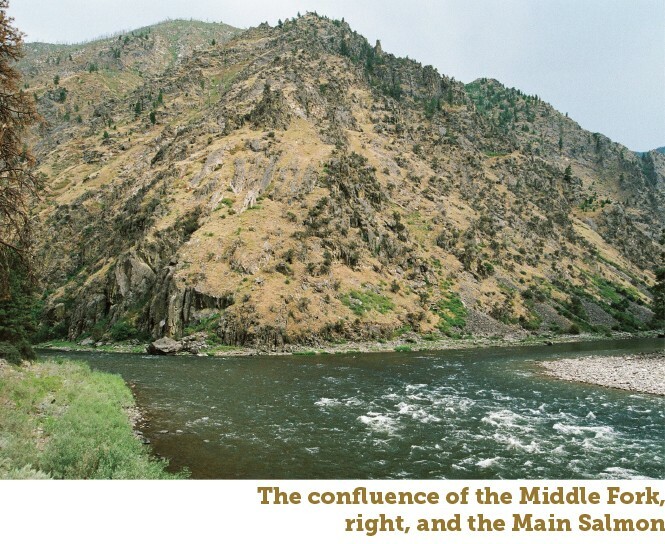 Unlike a float on a dammed river, the Middle Fork offers a clear picture of what a river system looks like. Over the course of its 104 miles, numerous creeks, some the size of small rivers, tumble through canyons and add to the flow. By the end of the trip, after descending some 3,000 feet in elevation, the Middle Fork morphs from an alpine stream into a flowing monster, complete with the customary massive boils, waves, and eddy lines that big water tends to breed. One of the Middle Fork's larger creeks is called Loon. On this trip, we managed to secure the campsite where the aquamarine waters of Loon Creek tumble into the Middle Fork. Any kayaker who's ever walked the mile and a half up Loon Creek to the hot spring located there has looked down on the creek with lust-filled eyes, saying quite bravely, and perhaps even drunkenly, "I'll run that next time." Charles the Shaman has said this so many times that, this time, he decided to make it so. After arriving at Loon Creek late in the afternoon, the four kayakers, Charles, Tommy, Robin and myself, dragged our boats up the trail. Along the way, we did our best to scout the creek, which didn't appear terribly technical but had its fair share of grabby rapids. Near the top, a downed log stretched three quarters of the distance across the creek. The approach to the log consisted of a pair of medium-sized rapids, which would have to be navigated smoothly. The log could certainly hurt, and possibly even kill, a boater. We crammed into our kayaks and set off down the short stretch. Within minutes, trouble came our way. Tommy found himself pinned against a large rock just above the log. Before I could make it to him, he had bailed out of his boat and was swimming. I heard screaming from the shore. The RPK, who had hiked up to watch, yelled down at Tommy to let go of his boat and swim away from the log. I paddled hard, keeping one eye on Tommy and another on the moves that needed to be made. As Tommy backstroked to safety, his boat went beneath the log. It let out a hollow thumping as the water pounded it against the log. When it finally flushed free, the boat sped downstream. Full of water, the boat was difficult to pull through the rocky creek. About 100 yards below the strainer, it became submerged and pinned on a rock about 10 feet from shore. Ty ing some quick knots and rounding up some carabiners, we managed to tug the boat, which had sustained a softball-size dent, to safety. It was a harrowing end to the day. Tommy the Hammer isn't easily flappable and wasn't flapped. Charles the Shaman got what he wanted and, at long last, floated Loon Creek. After dinner, we walked back up to the hot springs to retrieve Tommy's boat and do some soaking, mostly in peace. On the river, there are moments of great clarity and joy interspersed with dashes of fear. Fear of a rapid, or fear of what might be taking place at home—and fear of bear hunters. But what shines through is the freedom of a river trip. The freedom of being able to scream out about anything; the freedom of a set number of tasks woven into the routine of eating, drinking, pitching tents and breaking them down and sleeping and waking and grooving. But perhaps the greatest freedom wilderness affords is the freedom of the unknown. The thing that haunts my days and stimulates my mind as much as any other is the knowledge that there are places I can go where I am not king; where, with a stroke or two of bad luck and poor planning, I could freeze to death, drown or be crushed by a falling tree. Best of all, I think, is that there are creatures—blood-curtlin' ones—that could turn me into their evening snack with a slash or two of a paw. River-running season is still in full swing, and the lure to escape the city, work, crowds and civilization altogether is as strong as it was in the doldrums of winter. Even though I'm 184-river-miles richer than I was in April, I'm already mapping out next year's trips: how many beers I'll budget per day, which river permits I'll apply for, how many days I can convince the boss to let me take off from work. The beauty of protected public lands is that whether they're in Idaho, Utah, New York or California, they belong to us all. This was the message from a silver-haired ranger at the Main Salmon, who after warning us about bears and poison ivy and explaining that we must pee in the river, asked us a simple question: "Whose river is this?" Someone answered correctly: "It is all of ours." "That's right," the ranger said. "Enjoy your river and take care of it."